As this goes live, I'll hopefully be doing exactly this but in Sapporo and along the coast to Wakkanai. We'll be bike touring again, and so it seemed only appropriate to bring this first adventure back to the front again as a pleasant reminder of how it all began. I hope to be revisiting some of these spots once again in the weeks to come to see how things are going and to make some updates. My Japanese has improved exponentially, so it should be easier and a lot less scary than it was the first time, too! See you at the farm stand! A farm stand between Higashikawa and Asahikawa. Oh, yes. After hiking in Daistetsuzan National Park we spent some time with the Weymiller's at Square One. Their beautiful straw bale home is located in Green Village, an eco-suburb of Higashikawa, with sweeping views over rice fields heavy with grain to the mountains of Daisetsuzan. Part of our daily routine was to hop on the mamachari's (bicycles) and hit the highways and by-ways. Before it meets the mountains the land is quite flat, and the roads follow a fairly basic grid pattern between farms and tiny clustered communities. Meandering about on these took us past onion - tamanegi as well as negi (round, flat onions and the long green onions)- farms as well as fields of soy beans, squash, potatoes, rice, and hay. As I suspected (and fervently hoped) some farms sold their wares directly to the public. The stalls ranged from a simple roadside tent to a sturdy little hut. 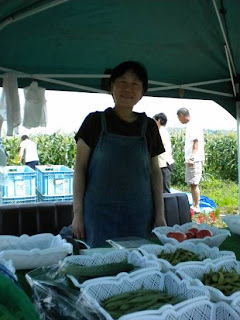 Sometimes the farmer was there to chat about the vegetables, and sometimes (again, just like Tokyo) a moneybox with a friendly thank-you note was all there was. Me at my favorite Higashikawa stand. Rumor has it their closed this year. Higashikawa's Michinoeki stand. Yummy veg with ice cream around the corner! 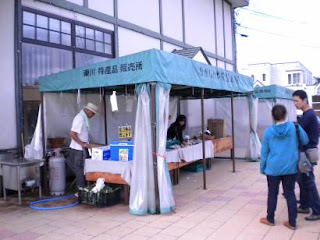 Another daily stop was the little farm stand in Higashikawa itself. Set up at Michikusakan, a.k.a. Michinoeki, the farmers did a brisk trade with folks stopping in for ice cream (made with milk from nearby Biei) and to peruse the sweet little shop proffering local wares. Here I bought a ginormous bag of shitake mushrooms, a lovely bundle of broccoli shoots, gave serious thought to muskmelon, and admired a tomato remarkably similar to my Black Zebras. Their sweet corn (tokibi in Hokkaido) looked good, but a group of older women snapped up the last of it the day I was there. Disappointing, but a sure sign that it must be good stuff. Food Studio Staff at the ready! A back road stand plum full. Just around the corner from Food Studio (Head back toward Higashikawa on the main road and turn to the left at the first street sign that says Kita 11 chome.) 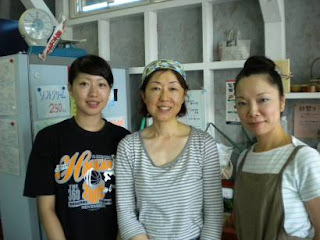 is another little gem in the world of local vegetables. All that indicates its existence is a little sign at the next right, but what a pleasure. One look down the road though, and the tent with the steady stream of customers is a vegetable lovers delight. Super long beans, regular green beans, cherry tomatoes and their larger counterparts, squash of all sizes, gourds, goya, sweet and hot peppers, and the usual tokibi (sweet corn) filled the table with their tasty goodness. Grown just around the corner (in Hokkaido that means about half a kilometer or so away) these vegetables are also not organic. Disappointing, but I'd say it's good for her that I showed an interest and good to help keep the family farming. A funky little stand with some good looking veg! 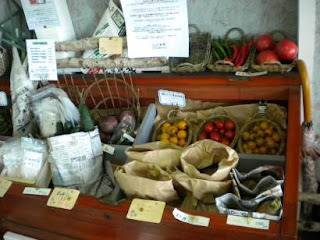 The final spot I visited for vegetables was a funky little farm where you could pick your own tomatoes. 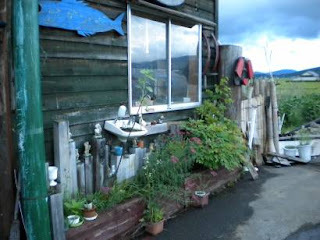 (The photo of the sunflower growing in the sink comes from there.) An eclectic mix of antiques, antiquated junk, and rummage sale materials joined an assortment of vegetables on the table. I could never find anyone around to talk to about picking some tomatoes, so I can't say too much about this one. It's worth a ride-by even if your bike basket is already full! 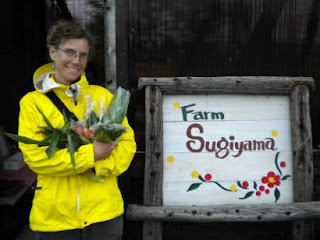 I'm a vegetable farmer and am heading to Japan in Feb. I'm hoping to check out some small scale (5 acres) mixed vegetable operations. Can you recommend any? I might be able to give you some good leads. Are you planning to WWOOF? And what part of Japan will you be in? That might make a difference.